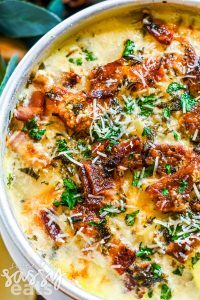 Easy and reliable Instant Pot Bacon & Herb Scalloped Potatoes are an indulgence and perfect for any holiday or special gathering! I love a good scalloped potato or au gratin potato recipe. But I felt like most times they were only one note or fell flat on strong flavors. Also my husband doesn’t really eat white potatoes, the only potato he really eats is a sweet potato. So, I wanted to make a recipe that he would enjoy and that I would enjoy. Most of the time I make this with JUST sweet potatoes, but a lot of people don’t like sweet potatoes so for this post I did a mix! Feel free to swap out the potatoes how you prefer! Look at those lovely layers of potatoes, cheese, cream & bacon! YUM! Cooking it in the Instant Pot makes this dish cook in half the time & use one less spot in my oven! When I bake in the oven or on my smoker, it sometimes takes longer to cook through. 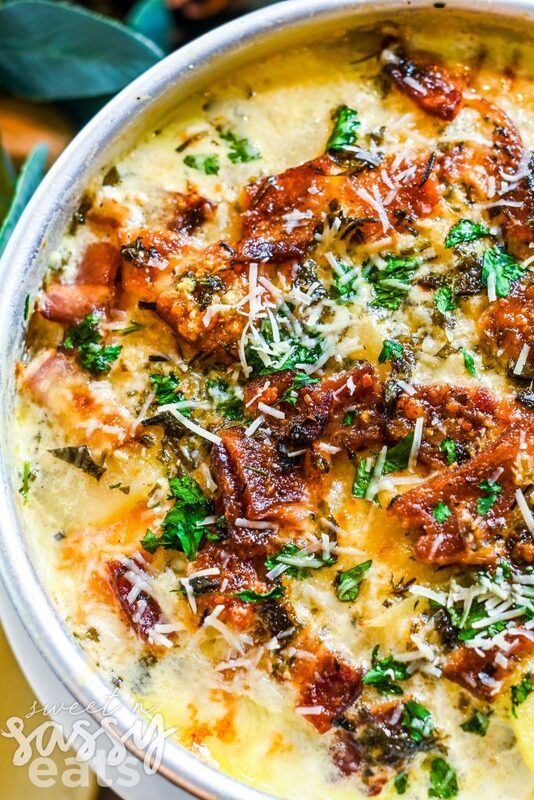 What I am saying is, Instant Pot Bacon & Herb Scalloped Potatoes are more reliable. Make sure to have extra fresh herbs for garnishing your dish afterwards. Allow the dish to cool for the full 10 minutes. This allows the cream sauce to sauce and the cheese to set so it holds together better, otherwise it becomes a sloppy mess that doesn’t plate well. 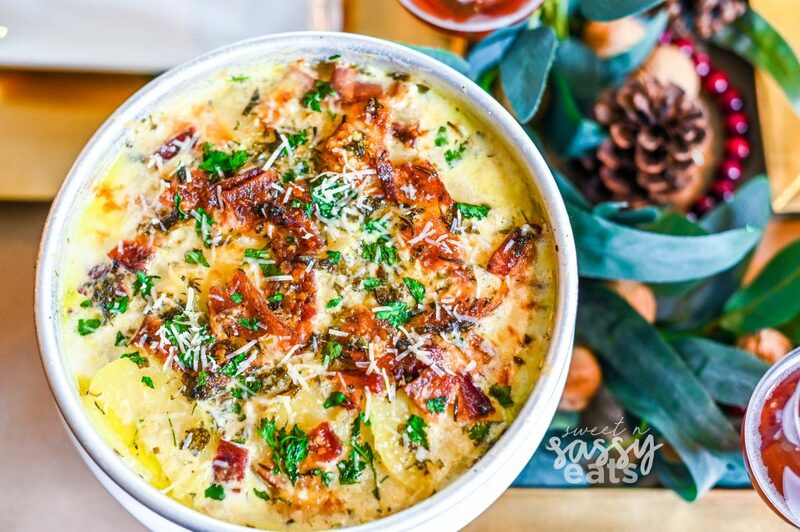 An elevated scalloped potatoes fit for any holiday or special occasion meal! You can even cook it in your Instant Pot! Not on the Instant Pot train yet? Look for alternate instructions for oven or smoker cooking instructions! Peel and thinly slice potatoes & Onions to about 1/8" (you can use an even mix of Sweet and Yukon Gold Potatoes) Or you can use all of one type, I typically prefer a mix or all sweet potatoes. In a separate pot, add Heavy Cream, onions, herbs & all seasonings together. Stir and bring to a simmer. Remove Bay leaves from cream and pour a a littel bit of cream in the bottom of each pan. Then pour the rest over all the potatoes. Grease 2 8" round pans (at least 2" deep) with butter. Layer the pans in this order: 1)Potatoes & Onions 2)Cheeses 3)Bacon & Repeat for a second layer. Pour the Cream over top of each pan evenly. Add 1/2 a tbsp of butter (cut into cubes) on the top of each pan. Turn oven to Broil and cook potatoes in oven until top is golden brown.Allow to cool for 10min and serve. Garnish with fresh parsley and chives. Preheat oven or smoker to 350 degrees. Grease a 9"X13" pan with butter. 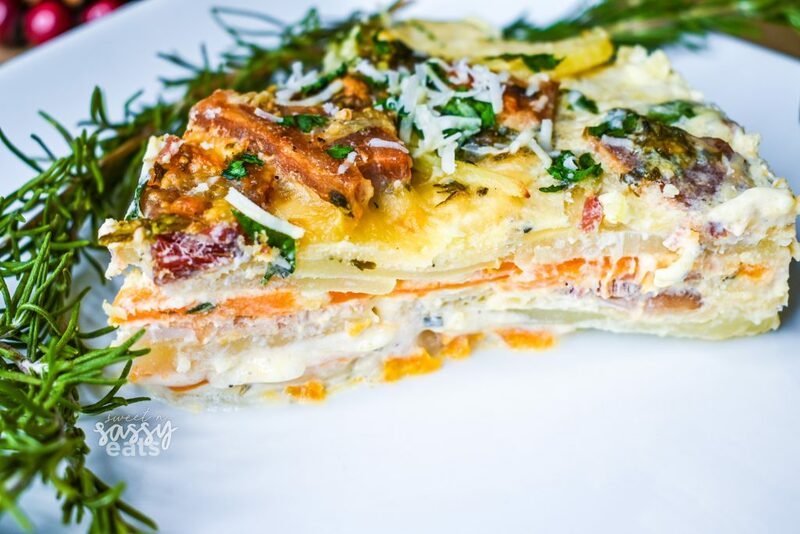 Layer the pan in this order: 1)Potatoes & Onions 2)Cheeses 3)Bacon & Repeat for a second layer. Pour the Cream over top. Add 1 tbsp of butter (cut into cubes) on the top. Bake for 40-50 mins (or until potatoes are tender). Turn Oven up to Broil or Smoker to Highest temp possible. And cook under cheese is golden. Allow to cool for 10min and serve. Garnish with fresh parsley and chives. Want more Instant Pot Holiday recipes? Check out these awesome other bloggers I have teamed up with to share with you all their delicious Holiday recipes! 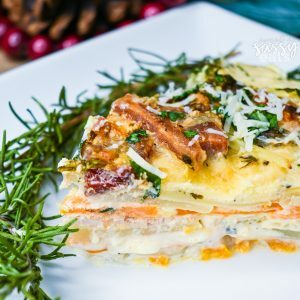 I agree, scalloped potatoes have to PACKED with flavor! This recipe looks amazing, thanks so much for sharing it!